I wanted to share some of my favorite school supplies with you all today! 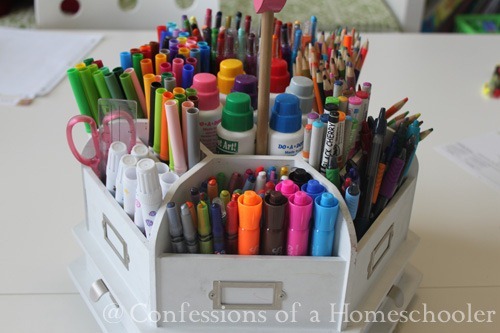 Here’s a post on our most commonly purchased student supplies for our homeschool. Do you buy new supplies each year, if so what do you normally get? Lat year was my first year homeschooling, I actually used your list of supplies in your Homeschool 101 book as a guide of what to get and that really helped me narrow down our supplies to what the girls really needed. During the year, we have had to replace or add to our supplies, so my plan for next school year is to just do an assessment of where we and but a few things that we need. Having a guide was helpful, as I fear I would have gone too crazy on school supplies, my girls and I both love school supplies in general. I love your site! I purchased the white carousel from Michael’s with a coupon and we LOVE it! Dot markers are a must, a laminator and Ticonderosa (sp?) pencils! I will purchase new supplies each year just because it starts a beginning with the kiddos. It also helps getting out backpacks ready for co-op. Each kiddo gets to pick his or her own style.